As the temples will be broken down to bits. Ended when the WIND rolled away the stone from the tomb. Shall the church be built, and not on Peter. It is to that Stone that David sings. And that was the Stone in David’s sling. Was permitted to cast his stone first. And saw He who was lifted up from the earth. He was bitterly defeated with and by the Word. That His praises shall remain on my lips on a daily bases. That He would never have to raise stones to praise Him. He will take with him all who carried their crosses daily. This is what happens when you listen to too much of HILLSONG’s CORNERSTONE album. 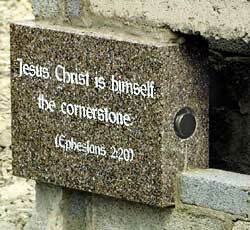 I’ve just been thinking about stones in the bible the whole day. And this is the result.